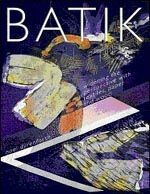 Batik Guild members are at the forefront of batik and textile design, and many have published books and DVDs. A selection of those available is included here, including some available online from this website. 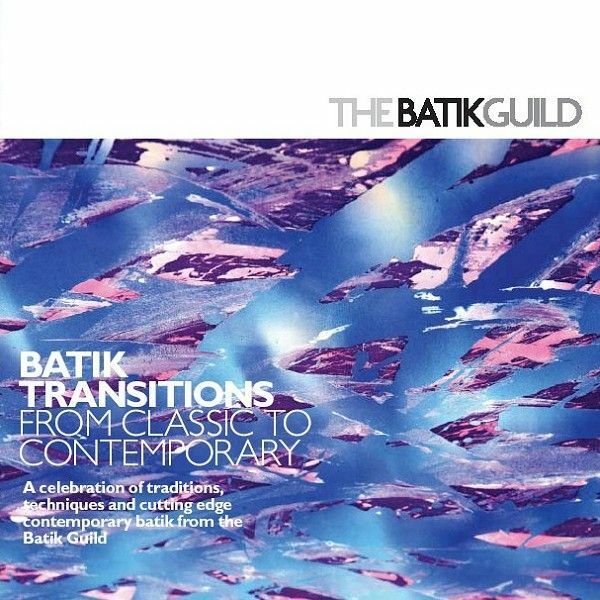 Published to accompany the Batik Transitions exhibition in 2006, the Guild's 64-page book is still available. It is beautifully designed and produced with over 200 full colour photographs. The first part looks at world batik with sections on Indonesia, China, and Africa. There is also detail on many of the other places where batik is made such as Australia, Sri Lanka and Malaysia. The second part highlights various batik and wax techniques and is the result of contributions from several Guild members. The final part is a gallery of contemporary work which has been chosen for its variety in media, techniques and expression. There is also information on books, websites, contacts and places to see batik in the UK. This book is available to members of the Batik Guild at a special low price of £7.50+P&P. The first in a long-awaited series of instructional DVDs by master artist Kiranada Sterling Benjamin. A “complete course on one disc” RO-KATA covers the origins of this unique process in 8C Japan and its contemporary development as a flexible art technique for applying pattern to fabric with wax and dye. 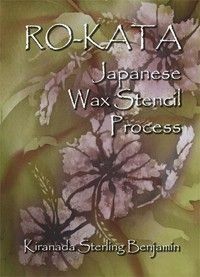 It is only in the past thirty years that ro-kata (wax stencil) have been explored enough to be a viable alternative to other pattern-making techniques such as cap, fabricated-metal wax stamps. This 53 minute DVD is accompanied by a booklet of written instructions on Process, Sizing and Steaming the fabric for permanency. This is the first DVD available, world-wide, of this exciting, innovative process. For the artists as well as the art educator: Ro-Kata gives information on how to prepare and utilize a strong re-usable paper stencil with confidence. The process of Ro-Kata comes with the advantage of a low investment in materials and greater flexibility for design building. It can appeal to the artist wishing to create single-image art and those wanting unique background pattern such as in the fashion industry. 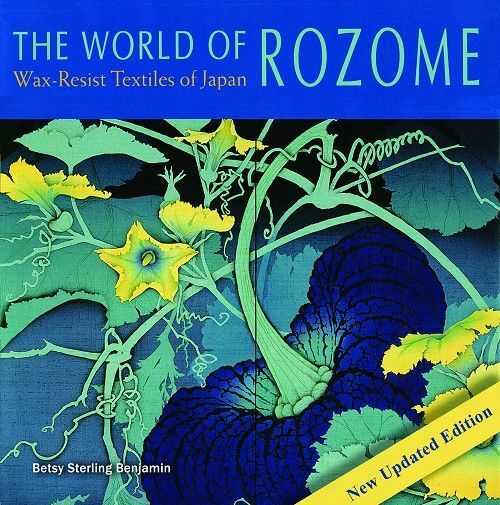 Kiranada’s research into ro-kata has spanned twenty-five years, and was first documented in the book The World of Rozome: Wax-Resist Textiles of Japan . Her personal work with ro-kata includes its use on kimono, obi, scrolls, standing screens as well as fashion and wall hangings. Stunning illustrations by masters and emerging artists. An introduction to the new ‘washable’ soywax. Professional application and adaptation of soywax. An overview of five specialized rozome techniques in soywax. Dyeing, setting and removal instructions. Updated suppliers and world-wide distributor lists. This DVD shows eight exciting projects; four on cotton and four on silk. It is suitable for beginners as well as those with some experience and incorporates several interesting techniques which can be used in a variety of ways. Batik has moved a long way since its interest in the West began. 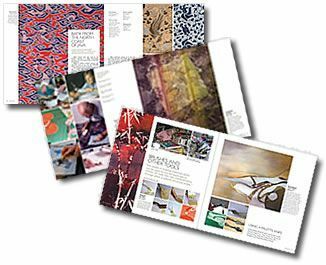 In Batik - New Techniques, New Materials, Britain's leading batik artist provides a book that takes the craft beyond the basics to include new materials as well as new techniques. Lavishly illustrated in colour and clearly arranged and written, it includes working on paper, wood and leather as well as textiles, plus a series of step-by-step sequences of key techniques. The work of the author and international batik artists and historical pieces will be used to illustrate the techniques and materials covered in the book. Rosi Robinson shows how to create beautiful batik designs and pictures, teaching all the techniques required through 9 step-by-step projects. From making simple marks and drawing with wax to dipping and painting with dyes, etching, cracking, discharging and more, the book contains all you need to create beautiful batik. A history of batik sets the scene and then there is detailed advice on all the materials and preparations required. There is artistic advice on using colour and on how to use hard wax, stamps and brushes through a series of appealing projects. Skills are built with each project and all the templates are provided. A gallery of beautiful batik artworks provides inspiration for beginners and experienced artists alike. In this double DVD, Rosi Robinson presents a variety of techniques with useful tips on how to create batik art. On DISC ONE, 'Paper Workshop', Rosi explores a variety of ways to use waxes, tools and dyes to achieve some incredible effects on may types of paper. She presents some great ideas for how to use the papers you have made - from wall art to greeting cards to illuminated lamps. On DISC TWO- 'Fabric Workshop', Rosi explores the use of traditional and non-traditional batik implements on both silk and cotton - using Indonesian and other waxing tools from around the world as well as things from around the house. She produces a range of results on silk and cotton - from wearable to wall art, exploring the richness of colour and the benefits of wax to surface design. Batik is an exciting and unusual art form in which vivid and original fabric designs are steadily built up by the repeated use of hot wax and dyes. By following seven easy to understand step-by-step projects, you will discover the fascination of this craft, which originated in the Far East and reached its peak in Indonesia. As a method of decorating and patterning cloth, the possibilities for experimentation are endless. The finished batiks may end up as garments, cushion covers, wall hangings or as pictures, stretched or dry-mounted. 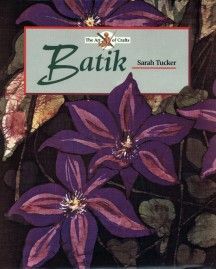 Sarah Tucker's own enthusiastic approach offers a stimulating introduction to batik for the complete beginner, but will also inspire those who already have experience in the medium. Sarah Tucker discovered batik in 1971 and has been addicted ever since. Originally a theatre company manager, she abandoned that profession to concentrate on a career as a batik artist and teacher. In addition to work in private collections, her batiks have been exhibited in galleries all over Great Britain. 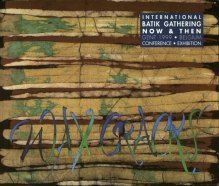 Catalogue of the International Batik Gathering 'Now & Then', Gent, Belgium, 1999. Features batik of all styles exhibited from 47 of the world's top contemporary batik artists, from Belgium, England, Ireland, Germany, Spain, Austria, Estonia, Rep of Moldova, Russia, Indonesia, Japan, China, India, Burkina Faso, United States, Chile and Australia.